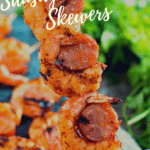 These fun Shrimp Kabobs are one of my favorite meals for a quick weeknight meal. 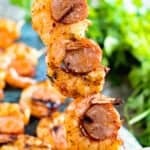 I always love eating shrimp and when you add the smoked sausage into these Grilled Shrimp Kabobs they are so delicious. Two of my favorites in one. 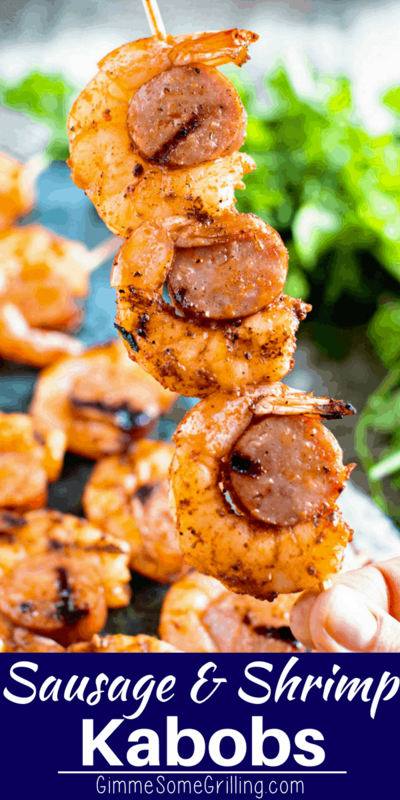 The addition of BBQ Seasoning on these Shrimp Kabobs provides just the right amount of zest. 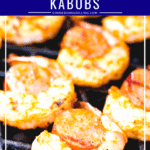 They just might be my new favorite kabob recipe! Actually, old since I’ve been making them for years! Guys it’s all about getting the meal on the table, right? 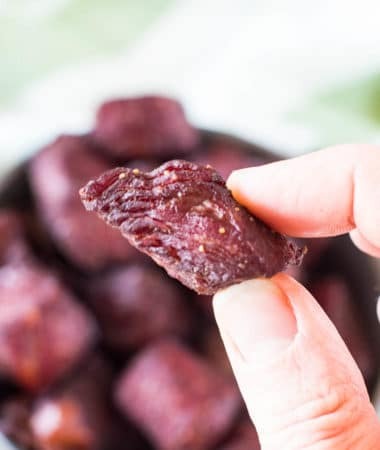 Quick and easy – big flavor that is made quickly on the grill! Kabobs are always an great weeknight meal. It’s fun to eat (food with a handle, gotta love that!) 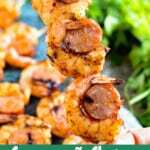 and these grilled shrimp kabobs are easy and delicious! Can you believe my kids actually love them too? My oldest child, who’s only six, LOVES shrimp so she’s snitching the middle child’s shrimp off her plate when she’s not looking, but the middle child is doing the exact same with the smoked sausage! They each have a different favorite so it works out great! 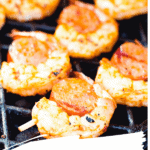 How long do you cook shrimp kabobs on the grill? Not long at all, even with the shrimp wrapped around the sausage, these only take about three minutes per side. Easy and quick, right?!! Don’t forget if you are using wooden skewers to make the kabobs, be sure to soak them for at least 30 minutes before grilling! 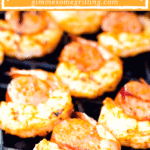 Do you grill shrimp with the shell on? You certainly can, but for this recipe be sure to remove the shells first. The shrimp for this recipe needs to be shelled and deveined. Can you believe it? Only four things on your shopping list for these delicious Shrimp Kabobs. Well, probably three because I’m guessing you already have olive oil on hand! Make sure the grill grates are clean. Cut sausage into about 1” slices (the same thickness as the shrimp). Place shrimp in a bowl. Add sausage, olive oil and Barbecue Seasoning, toss to combine. 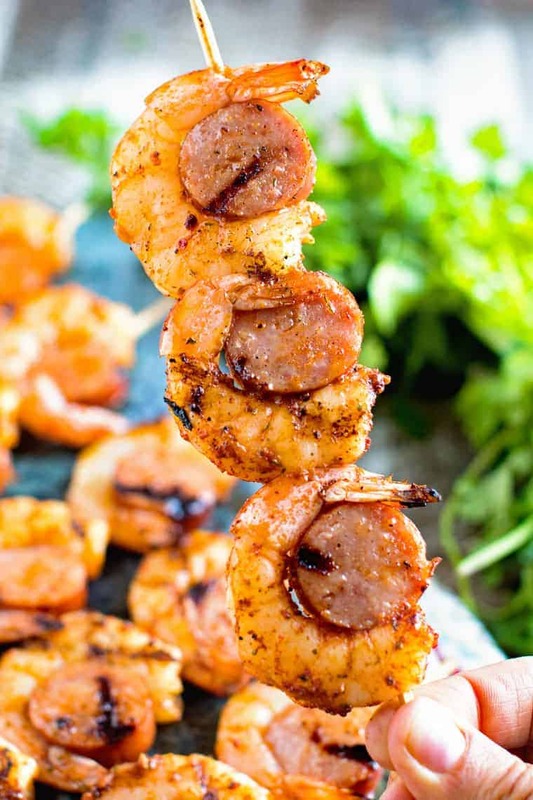 Tuck the sausage slices in the “C” curve of the shrimp, thread them on the skewers. 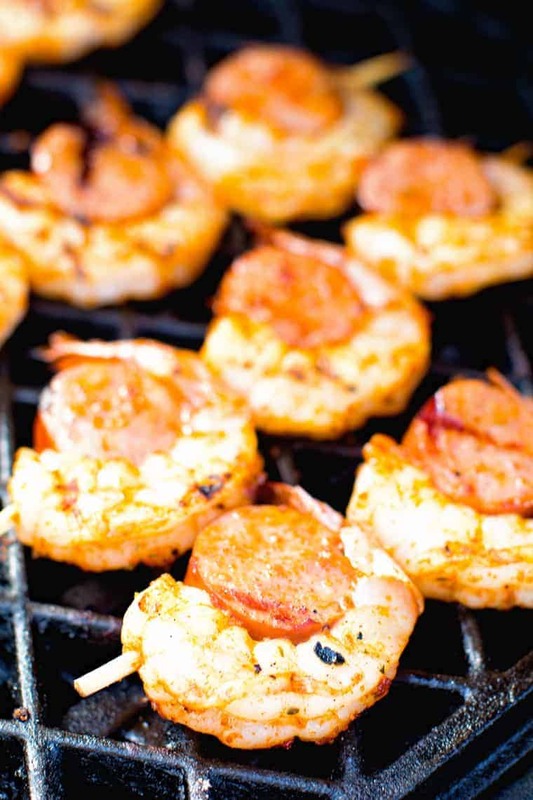 Grill over medium-high heat until shrimp are opaque and cooked through. I purchase shelled and deveined shrimp, but what if you can’t find those or your store doesn’t carry deveined shrimp? It’s really not hard to do, let me walk you thru this. Start by rinsing the shrimp under cold water. Discard any shrimp that are slimy, look or smell spoiled. The shrimp should smell fresh and like the ocean, discard any that aren’t! Peel raw shrimp, start underneath, where their legs are attached and just peel them off. I left the tail segment, but that’s just for looks, remove if you’d prefer. To devein the shrimp run a pairing knife down the middle of the back to expose the vein. Lift it out and discard, rinse well. More great kabob recipes? You betcha! Check these out!! 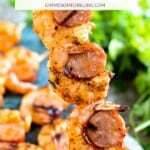 These Sausage and Shrimp Kabobs are packed with flavor and super easy! They are the perfect way to make dinner on the grill when you are busy yet these skewers are fancy enough to serve at your next BBQ! Preheat grill to 350 degrees F. Make sure grill grates are clean. Cut sausage into about 1'' slices, the same thickness as the shrimp. Pat shrimp dry with paper towels. Place shrimp in bowl. Add sausage, olive oil and Barbecue Seasoning, toss to combine. 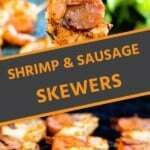 Tuck the sausage slices in the "C" curve of the shrimp and then thread them onto skewers. 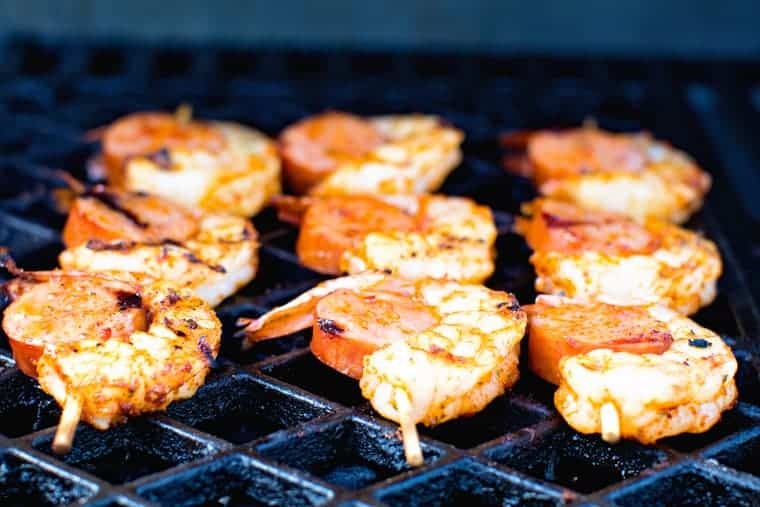 Grill over medium-high heat for about 3 minutes, flip and grill until shrimp are opaque and cooked through. Serve immediately. If you are using wooden skewers remember to soak them in water for at least 30 minutes to prevent them from catching on fire when you grill. 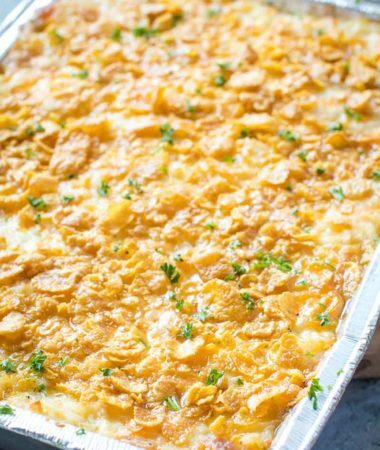 I have a question – could these be done in an Air Fryer and if so what temp and how long would you recommend? Hi Julie! I’m sorry I haven’t ever tested it in an Air Fryer! Loving how the shrimp wrap the sausage on these and hellooooo delicious! 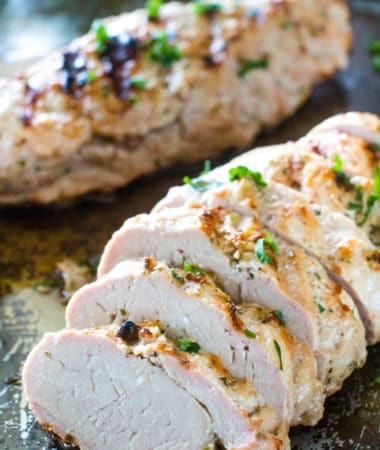 Perfect for weekend grilling! They are! Always a hit! I’ll have to try these kabobs with smoked sausage. I make almost the same thing but use chorizo because we like the added spiciness. They do make a great dinner and love that there’s little cleanup afterwards. That sounds excellent too when you want a kick! I would just broil them a few minutes on each side, make sure to soak the skewers in water if you use wooden ones! If i broil them in the oven how lobfmg do u think i should leave them in and if i should turn them while cooking? I’d broil 2-3 minutes and flip it over and broil an addition 2-3 minutes or until the shrimp are opaque.